This "Historically Speaking" column was published in the Exeter News-Letter on Friday, January 18th, 2019. Guideline #1: We can’t take everything We’d love to – believe me. There’s a fine line between “archivist” and “hoarder.” Those of us who are involved in the care of historic resources are here because we love the objects, photos and documents that tell us about the past. If you get two museum people together, they will automatically start talking about their collections. They’ll probably also talk about the things they couldn’t keep. Museums and archives are tightly bound by something called a collections management policy. This document, updated periodically by the governing board, is what keeps a museum from becoming a snake-pit of historical debris. The collections policy defines the purpose of the museum and the type of materials that can be collected. 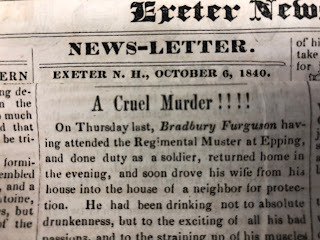 Our policy, for instance, says: “The Society’s museum collection shall comprise those artifacts which document or illuminate the history of Exeter and the lives and society of its people from its settlement to the present. Highest priority will be given to the acquisition of artifacts documented as having been made or used in Exeter or associated with Exeter persons, events, or themes.” We cannot take items that are simply interesting antiques. There has to be a connection to Exeter, New Hampshire. Sometimes the decision is tough. A painting of George Washington that hung on the wall of your Uncle Joe’s house on Water Street doesn’t have enough Exeter involvement. However, if your Uncle Joe painted it in art class at the Tuck High School in 1925 as a decoration for the George Washington Ball held at the Exeter Town Hall, well, then we’ll talk. Sometimes we have to decline a donation because we already have the item. Yearbooks, town reports, newspapers (and newspaper clippings), postcards and books frequently fall into this category. However, we’re happy to look over what you have – sometimes our copy is tattered or we’d like an extra to use for school programs. It never hurts to ask us. We have to be very protective of our shelf space, otherwise we’ll run out of space for the things we need to fulfill our mission. Try to donate things to their place of origin. 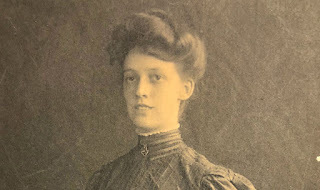 If you find photos of your grandmother performing in a play in Haverhill, Massachusetts, find out if the Haverhill Historical Society would like them. Your aunt’s chatty letters from Windsor Locks, Connecticut? Just imagine the details about Windsor Locks that she might be spilling. Be sure to tell the receiving organization anything you may know about the person connected to the item. 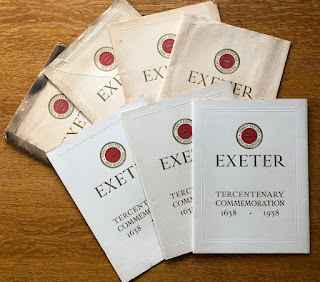 We absolutely love it when materials about Exeter find their way back to us. Everything in our collection is considered priceless. We do not collect things based on their monetary value. We’re also not allowed by law to put a value on an object, so we can’t play “Antiques Roadshow” with you. If you want to have your item appraised before you donate it, you’ll need to talk to an appraiser. The IRS won’t accept a letter from us verifying that the Lamson earthenware jug you donated was valued by us as “really, really cool!” Although the Society has occasionally purchased items (perhaps a dozen or so times in our 91 year history), we really don’t have the resources to offer payment for items. This means that sometimes we have to watch a potential donor walk away in search of a better offer. Trust me, this hurts us more than it hurts you. Our collections policy says, “All acquisitions must be obtained free and clear without restrictions as to use or future disposition.” As a rule, we don’t take things ‘on loan’ unless it’s for a limited exhibit. If you donate photographs, we will own the copyright and can publish or use the photos as we see fit. If an item in the donation is best suited for another museum, we will most likely send it along. We will ask you to sign a deed of gift stating all of this. It’s part of the donation process. And keep in mind the burden is on the donor to have clear title of ownership before you donate the item. Be sure to check with your siblings before you donate your parents’ letters to the Historical Society. Don’t want to go through the paperwork? Please don’t leave boxes of stuff on the front porch. Undocumented materials create headaches for both the staff and researchers who may want to use them. A hefty part of the value of something is its connection to the person or place it comes from. It may be a flashy hubcap, but without some context, it tells us nothing. However, if it’s Elvis’s hubcap from when he was driving through Exeter, that’s a story (and I might add, “I wish”). Come inside, or if our hours aren’t good for you, call us and we can make an appointment. Guideline #6: If you’re not sure – contact us. This brings us joy. We love talking to you and if your treasures don’t fit in with our collections we may be able to give you some advice on where they might go. There’s a place for everything. There’s even a Jell-O museum for heaven’s sake. And please consider funding your donation. We store materials in archival boxes, which can run into some money. Becoming a member helps us fulfill our mission of serving as the stewards of the history of Exeter, New Hampshire. Image: The 1938 Tercentenary Program commemorated 300 years of Exeter’s history. The Exeter Historical Society has plenty of copies of this program. If you should find one in your home while tidying up, pass it along to your children!